If your fireplace is sending smoke curling out into your room, then this smokeguard may be the solution. Designed specifically to fix this problem, this black poweder-coated painted metal smokeguard brings enjoyment back to your fireplace by eliminating that aggravating smoke leak. The guard works with the chimney to ensure a proper draft up and out of your home. You'll find an easy solution with spring load installation, and included heat resistant caulk to provide a good seal and ensure no smoke trickles through the cracks. Enjoy your fireplace once again by installing this smoke guard. I need a smoke guard 58 inches wide and eight inches high ? Unfortunately, we do not carry a smoke guard that large. I apologize for any inconvenience. eFireplace had the product we wanted at a great price. The delivery was quick and customer service was convenient and knowledgeable. 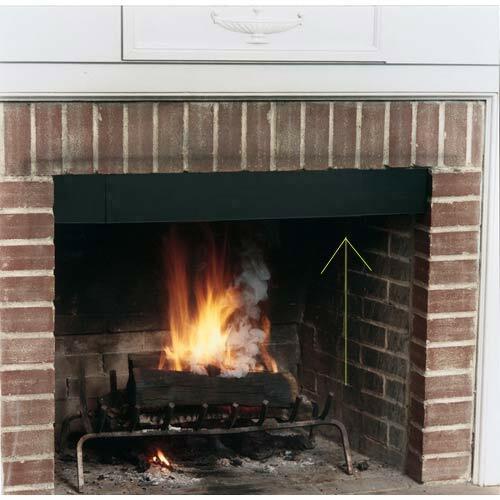 This product completely eliminated the smoke from escaping from the fireplace into our home. We have a fire going almost every night since we installed this product. Works Perfectly!!! ProsEasy to install and looks great. I wish I would have purchased sooner!!!!! Since having our fireplace built 4 years ago we had not been able to enjoy it due to the heavy smoke rolling out of it every time we used it. All of our house had a strong smoke smell, even our furniture use to smell like a BBQ smokehouse. I was kind of skeptical about this product but decided to purchase it. After installing and started a fire and not a bit of smoke came out. I should have purchased sooner! I could not use my fireplace because of too much smoke. I even raised the flu 7' no luck. I tried one last thing and installed a smoke guard (works perfect!) no smoke AT ALL! A little trick: I tilted the top back about 3'' makes it look like it was built into the fireplace. Try it. great product - no more smoke rolling out of the fireplace.